entire trail, encountering much more solitude, wilderness, and difficulties in his hike than today's hikers. 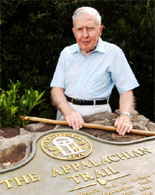 Gene Espy is a well-known speaker who enjoys telling about his AT hike and many other experiences. His now vintage hiking equipment is on display in the visitors center at Amicalola Falls State Park, Georgia near the Approach Trail to Springer Mountain. how I make my "to pack or not to pack" decisions. Feel free to bring along your own gear for a shake down or discussion. Michelle "Brownie" Pugh fell in love with the outdoors as a child at summer camp. When she was twelve she learned about the Appalachian Trail through a camp program, and she has been hiking ever since. 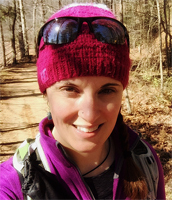 Michelle has hiked the Appalachian Trail, the John Muir Trail, the Foothills Trail, and the Wonderland Trail. She leaves for the Tour du Mont Blanc trek in the Alps a couple of days after 2017 Trail Fest. Her first memoir, Love at First Hike, describes her adventures-and misadventures-on the Appalachian Trail. The stories of the characters she met and the lessons she learned are woven amongst details about wind-swept mountains, tranquil valleys, and peaceful trail towns. 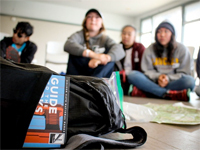 Her second book, Lost and Found, a tug-at-your-heartstrings dad and daughter adventure tale about her thru-hike of the John Muir Trail was debuted at Trail Fest last year. "An Adventure in the Theater of the Mind"
"The Trail is Full of Surprises"
Many years ago I had dreams of participating in an AT trail hike and then had them dashed by a spinal cord injury. For the years before my injury I often dreamed and talked about making an attempt at an AT hike. Scratch that, for an AT hike I figured my chances were slim to almost none to fill that exhilaration. As time went on and I grew within my disability, I gained many skills that helped me to pursue other meaningful Adventures. But still the call of the wilderness was there. Over the years of my friendship with high school classmates on Facebook I often saw them post pictures and comment on them. At one point a few years ago I ran into a classmate, Lee Griffith, and asked if he thought he could get me back out on the trail. Some time passed and then one Christmas holiday I messaged him directly on Facebook and said did you really think you could get me back out on the trail!? Shortly thereafter a message came through with a definitive yes. The rest of the tale only Trail family can really understand, but I like to share my thoughts in memories for all those who dare to take an Adventure in the Theater of the Mind. 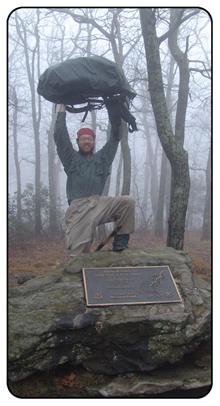 a life changing journey when he hiked the Appalachian Trail, over 2000 miles from Georgia to Maine. Join us, as we welcome Gary for stories, photos, laughs and inspiration, drawn from his experiences living among nature. Gary hails from Asheville, leads workshops on respecting the wilderness, tells stories for NPR's "The Moth" and his book, "Where's the Next Shelter?" is a best seller in Travel and Adventure. "Cherokee Medicine from the Sidewalks of Dahonega"
Join Mark Warren at the main stage in Hancock Park for an orientation and then a walk around Dahlonega to learn about some plants that provided medicines for the Cherokees. Mark is a naturalist, author of books on Cherokee lore, and Director of Medicine Bow, a "primitive school of earthlore." 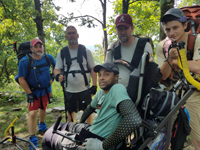 "What's Going on on the AT?" Learn about the impact of the movie "A Walk in the Woods" on the Appalachian Trail, trail maintenance handled by thousands of volunteers, and the Leave No Trace method of low impact camping. Come hear our panel of hikers who have thru hiked the Appalachian Trail and some that have done other long distance trails. Bring your questions, as this session is audience question driven. Get several perspectives, as there is no one way to long distance hike. "How Outdoor Enthusiasts Aid in Stopping the Spread of Invasive Species and Preserving Our Native Environment"
The Hemlock Wooly Adelgid is decimating the population of the Eastern Hemlocks throughout the forests traversed by the Appalachian Trail and other trails. Learn about this problem and what you can do to help. "The Hemlocks Are Crying for Your Help"
Learn about the insect that is decimating the Hemlocks, including identification of the pest threatening our hemlocks, what's at stake if we lose these iconic trees, 3 integrated ways to save them, and opportunities for volunteers of all ages. 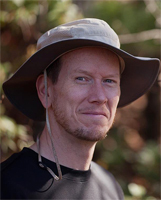 "Wilderness Survival: Packing Your Brain"
A former U.S. Air Force Survival (SERE) Instructor will pack your brain with a tad of "S***, never thought about that!" What needs said I'll be saying, come listen.